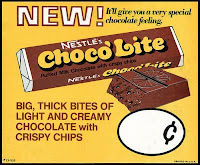 Remember Choco'Lite? It had little holes in it like someone sucked all the puffed rice out, and a cool little fan pattern on top of each piece. Aero Bar is similar, but just not the same. Also, that is the most 70s-themed candy wrapper ever. Earth tones! Chubby font!